All of our rooms benefit from the highest quality linen, using Egyptian Cotton Berties, is a large room in the lower-ground floor, and it is fair to say that it does not look or feel like a basement! The room benefits from large glass doors leading to a private patio garden, with table & chairs and large swinging (Emmanuelle type) wicker chair. 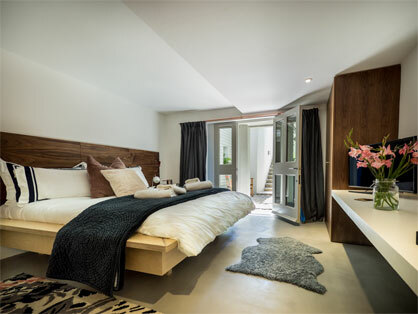 We recently re-furbished these rooms to a very high specification including Micro-cement flooring throughout, with concrete walls in the separate shower and toilet and a contemporary bed, designed and made by our son. There is a small kitchenette with fridge, sink and a good quality coffee machine (No cooking facilities). We provide tea, coffee, fruit juice, milk and home-made granola, fresh fruit and yoghurt in the room for you to enjoy at your leisure. There is Wi-Fi and Sky Q TV, including Sports package. Minimum stay is 2 Nights and the rate is £90.00 per night. The management reserves the right to make changes at other busier times. Discounts can usually be negotiated for longer stays.